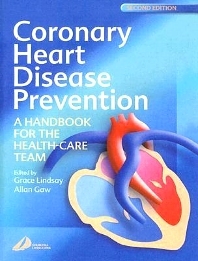 Review quote "An excellent handbook which covers all aspects of coronary heart disease and will serve as a very useful reference for nurses working in primary and secondary health prevention". Preface. Coronary heart disease: epidemiology, pathology and diagnosis. Risk factor assessment. Lipids and lipid-lowering drugs. Hypertension and anti-hypertensive therapy. Lifestyle management: smoking. Lifestyle management: diet. Lifestyle management: exercise. Lifestyle management: facilitating behavioural change. Medical management of coronary heart disease. Cardiac rehabilitation.Women and coronary heart disease. Type 2 diabetes and coronary heart disease.